It is lovely to have a garden and it will increase the resale value of your home as well as benefitting your health and bringing pleasure to the family. Vegetables and fruit can be grown in the garden to help the budget. However, the water bill can be high unless you take steps to conserve water. It may be possible to water a small garden by hand, directing the water at the roots rather than wasting water on leaves and areas where there are no plants. Once plants are established it is more efficient to give plants a good soak as needed to encourage deep root growth rather than sprinkling water every day. 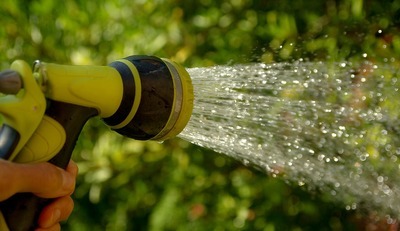 Soaker hoses can provide an economical way of watering some parts of the garden. If you use a soaker hose or sprinkler, a timer tap can be set so you don't forget to turn off the tap. How frequently you need to water depends on the type of plants and the weather. Some plants will survive with little water. Water early in the day, before 10am or in the evening before the sun sets. Some experts say watering at night can cause fungal growth. However, I sometimes water at night and have never found this a problem. I live in a dry area and perhaps it is more of a problem where the climate is humid. Watering during the heat of the day is not recommended as it results in water evaporating before it has a chance to soak into the soil and can cause burning of leaves. Add wetting agents to the garden or pots if the soil tends to repel water. There are a number of products including water storage crystals, soil wetter that is mixed with water before applying and granular products which act as a soil wetter and plant food in one. Talk to a gardening expert for advice about the best product for your garden. Some products are expensive but you may be able to get them on special. Manufacturers claim some water storage crystals last up to five years so the initial outlay may be recouped over time. Improve your soil by digging in manure and compost so the soil retains moisture better. Free manure is sometimes available from people who own rabbits, chooks or pigeons. You can make your own compost in the backyard. Mulch your plants. There are various forms of mulch to conserve the moisture in the soil and protect surface roots from the heat of the day. Some mulch is expensive to buy so it is worth doing some research on the most cost effective type for your needs if you can't access free mulch. I have read pine needles are effective as mulch and do not make soil acidic as was once thought. If you have pine trees nearby you can get needles for free. Leaves may be used as mulch but some leaves, including eucalyptus and camphor laurel, should not be used fresh but are suitable if they are composted first. Lawn clippings can make good mulch as long as there are no grass seeds or long pieces of runners which will germinate and spoil your flower or vegetable garden. To avoid burning your plants, place clippings away from plant stems and do not mulch too thickly. You may be able to borrow a shredder or mulcher to make mulch from thin garden prunings and bark which you would otherwise dispose of. Position shade loving plants in shady areas where there will be less evaporation. Choose plants with low water needs. Perrenial shrubs often don't require much water once they are established. Plant a lawn which doesn't require much water. Get advice about how much water your type of lawn requires and do not over water. Use cooled water from cooking vegetables (if you cook without salt) on pot plants. In addition to saving a little water, your pot plants will benefit from nutrients in the cooking water. Save other bits of water in the kitchen to use on the garden. With some thought it is possible to conserve water so you have a nice garden without a high water bill.